My daughter is getting to the age where she just absolutely loves animals. Any chance she gets she’s trying to pet something, or calls out when she sees an animal on TV. Now being animals lovers ourselves my wife and I obviously want to encourage this so we decided to take a trip over the Delaware River into Pennsylvania to check out the nearby Philadelphia Zoo. 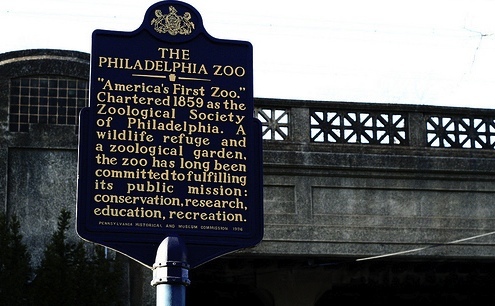 The Philadelphia Zoo is very proud to be “America’s First Zoo” and there are lots of signs around letting everyone know. They have recently done some renovations to the surrounding area and even added a parking garage which makes visiting a whole lot easier than it used to be. Our primary reason for the trip was so Hanna could spend some time enjoying all the animals, but an added bonus is the zoo has quite a few penny machines. Well…I should say used to have quite a few. 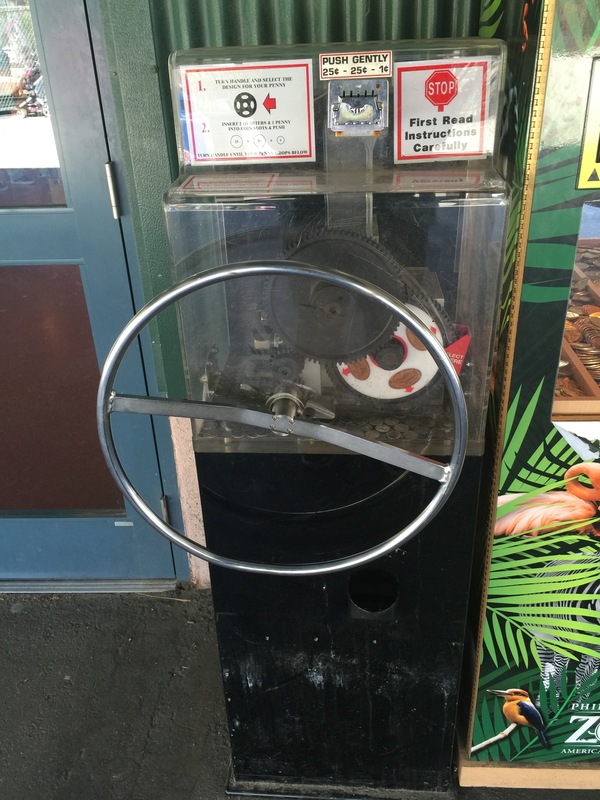 We go to visit the zoo at least once a year, and the machines here have been the same for the last few years but are usually moved around to different locations which still makes finding them fun. This trip however I could only find one machine. The designs hadn’t changed but the location did, this year it was located across from Big Cat Falls at the Trading Post Gift Shop. The machine had seen better days and was a little hard to use. The designs came out okay but as you can see from the below picture there were a lot of rogue quarters in the bottom of the machine. After a little elbow grease I was able to press the 4 designs. But was thinking the whole time that this maybe the last time I get to us it. 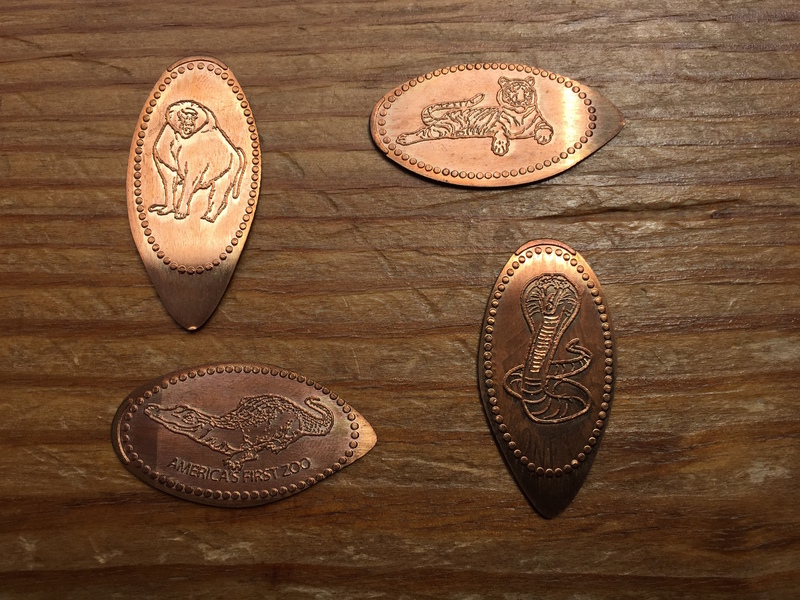 Just like any zoo the penny designs were of different animals. The designs included: A Baboon, Tiger, Alligator, and Cobra. 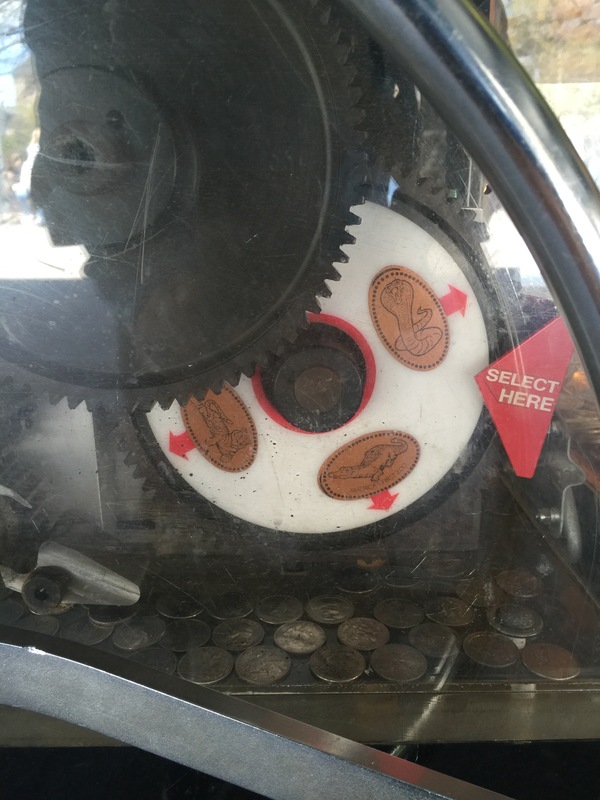 You can see the coins did press with a little bit of a tail on them, but I find this is pretty standard for this style of machine. We enjoyed the rest of the day at the zoo, and Hanna loved the Kids ZooU where she got to pet some goats, and a pony. She kept asking for Elephants but amazingly they didn’t have any this time. By the time we were done walking the zoo everyone was tired and ready to head home. I’m holding out hope that the penny machines were gone so they could update the designs. But who knows. I’m planning to take a trip back later in the summer and hopefully I’ll have some good news to share at that time. Until then there is one machine here if your interested, but like the Elephants it may be gone before you know it.